When our daughter was around three years old, she was obsessed with yellow cars: Where were they going? What did people who drive yellow cars like to eat...bananas? If we saw a yellow car when we were driving, she would ask me to follow them. It made for a thrilling experience every time we saw a taxi. In July of 2001, my mother-in-law died in her sleep. What is it they call heart disease...the silent killer? Our family was in total shock. My husband and his siblings were rocked to their foundations with sadness and grief. It was one of the hardest times in my life, and it was heart wrenching to watch my husband grieve for his mother. She was 61 years old. Here’s where things get bizarre: the day before she died, my mother-in-law had bought a brand new car. It was a small sport utility and had 12 miles on the odometer. The car was yellow. The night she passed away, she called my sister-in-law and left a message, telling her that she just bought a bright yellow car; everyone would recognize her car when she was driving around. The car was one of a thousand details that our family was left to try and deal with. Since the car hadn't been off the dealership lot for more than 24 hours when my mother-in-law died, my husband asked me if I would contact the dealer and make arrangements to return the car. Of course, nothing is simple. A passed before I was able to call the dealership. By that point, I was told the loan was ‘in the works’ and regardless of having a death certificate, the estate was responsible for the car payment. Had my mother-in-law lived three more weeks and died after turning 62, a reversal would have been granted because she would have been considered elderly and a special policy within the company would have gone into effect. What the hell?! Grief aside, it was one of the most ridiculous, unfair, and frustrating situations I've ever been involved in. None of the siblings needed a new car. And of course, there was the color: it wasn't a soft yellow...it was a full-on school-bus yellow. After some discussion, “Well, we could have it repainted…?" my husband and I decided to buy out the other siblings' debt and replace my 10-year old car. 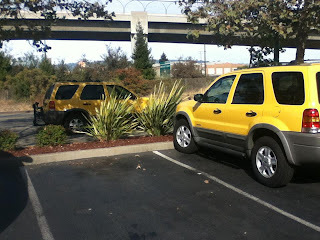 I felt conspicuous as hell at first driving the yellow car; any lame driving error I made was magnified by the beacon of yellowness. Once we were back home and trying to settle back into the rhythm of our lives after my mother-in-law’s death, I looked into the cost of repainting the car but it was too expensive. The Yellow Car stayed yellow. We had a lonely, older neighbor who would occasionally make the long walk over from three houses down. He would knock on the door to chat or stand at the edge of the driveway to make conversation. However, he was alone without a spouse or family for a reason: he was insufferable. He’d offer landscaping advice: “Why’d you dig those trenches so shallow?” He would ring the doorbell when the baby was sleeping, which would set off the dogs...and then ask why it took so long for me to come to the door. He would drive down the street, and then stop in the middle of the road to try and make small talk with a neighbor on foot, while his ailing truck idled and belched fumes onto the street. When we brought Yellow Car home after a heart wrenching week, our neighbor made his long walk down and to ask me why I bought a car that color. To make matters worse, he was hard of hearing – so I found myself yelling information that ordinarily would have been spoken in a quieter, more reverent tone: “MY MOTHER-IN-LAW DIED! THIS CAR WAS HERS! I HATE THE COLOR!” The whole situation was so outrageous on so many levels that I no longer dealt with our neighbor from that point forward. I believe in being kind and giving people the benefit of the doubt, but I also believe that just because someone is older doesn’t give them the right to be a tool. It turns out there are advantages to having a yellow car. A woman changed lanes suddenly and sideswiped my car; afterward she made the lame statement, claiming that she didn't see me. Um, no...I’m driving a freaking highlighter. My old car was a white sport utility. There was a dozen times when I’d walk out to the parking lot to a sea of white sport utilities and have no idea where I’d parked my car. With Yellow Car, I no longer have that issue: HERE I AM! SECOND ROW, THREE CARS OVER! The older I get, the less I believe in coincidences or kismet, but it gives me comfort that my mother-in-law would have wanted me to drive a newer, safer car with her young grandchildren. It’s been over 10 years since she died. After all this time, I’m somewhat nostalgic and sad to see the wear and tear on Yellow Car: peeling vinyl from the inside of the door, the rubber track that sits around the door frame falling off, stripped knobs and ripped leather. The car has grown on me and it feels like one of the last tangible connections that I have.